All internal wiring is made of high purity OFC copper with waxed cotton insulation. Brass bracing parts with felt acoustic isolation are used to minimize vibrational transfer on the contact points of the different horns. The horns themselves are mechanically time aligned for a time coherent result. Mid and high frequencies level adjustments are available to the user making it possible to fine tune the ANIMA to the listening room. 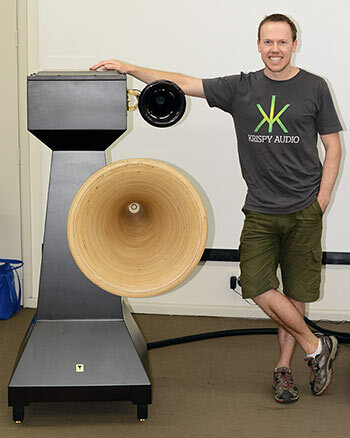 There’s no denying the Tone Audio Anima speakers were huge. Their foot print was about 900x900mm. Their height was about 1.60m. The large midrange horn floated outside their large foot print. They had an equally huge sound stage– an expansive, billowing sound stage but to their credit, they didn’t exaggerate the size of voices and instruments. The Anima’s could play quite loud, as is typical of most horns. However, to my ears, they didn’t always sound continuous across the frequencies. And given their size, they will likely sound best in a large room and are likely not intended for near-field listening. (Their web site recommends a listening distance of > 3 metres.) Listening at a distance will likely alleviate the sense of hearing individual drivers but you may then lose a sense of immediacy and excitement, depending on your room. The Anima’s were fast and quite detailed. They didn’t exhibit the somewhat cupped sound often heard in horns of old. Their timbre was quite good, and after a number of tweaks (with the mid and high controls) during the first half of the meeting they started to sound much better. Horns are not known for deep bass. The Animas were no exception, but with the fairly large Wilson Benesch sub-woofer on low it tunefully filled out the lower octaves. 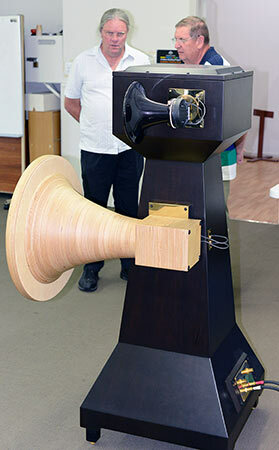 Although the Anima’s are large, the speakers on their own shouldn’t cause a bass overload in your room. We didn’t have a guest presenter for our member’s music segment in October. Hopefully someone will come forth for our November meeting. And during our break, Steven Polley treated us to some very tasty profiteroles he’d made. He brought in 4 or 5 flavours. I resisted well enough to experience only 1 flavour..! Cameron struggled a bit on the day with all the gear. He slightly under-estimated the volume he was to bring. In the end, he had to utilize 3 cars and vans and 2 strong friends – John Browne and Graham Monnox but it was all worth it! Thanks Cameron.